Speaker of the House Paul Ryan has put all of his eggs in the tax cut basket, and reports say that he’s furious with Treasury Secretary Steve Mnuchin for doing such a terrible job at selling the legislation both to the American public, and to members of Congress. The real problem that Ryan has is that Mnuchin has let it slip that the bill will be great for the wealthy elite but not so great for everyone else, and Paul Ryan wants him to lie more. Ring of Fire’s Farron Cousins discusses this. Paul Ryan, Speaker of the House and basically one of the top representatives for the Republican party in the United States is absolutely pissed off that Treasury Secretary Steve Mnuchin is not lying enough to both the American public and to Congress to be able to sell Paul Ryan’s disastrous tax cut package. Paul Ryan is a guy who has put all of his eggs into this tax reform basket. He has been tweeting nonstop every single day about this tax cut legislation, lying to the public, saying that it’s going to help the middle class, it’s going to help the working class. It’s going to help small businesses. In fact, it’s not going to do any of those things but that’s what Paul Ryan keeps telling us because that’s the only way he can sell it to the American public. And he thought that he had an ally in Steve Mnuchin but unfortunately Mnuchin has on occasion allowed the truth to slip out. Mnuchin, during interviews, has admitted that this tax cut package is going to cut taxes on the wealthy and in the end probably won’t do very much for the middle class whatsoever. And Paul Ryan is pissed off because he knows what Mnuchin has to tell everyone in order to sell the package and that is, it’s not a tax cut for millionaires, it’s for the working class, it’s for the average people. Unfortunately for Paul Ryan, everyone of us in this country knows the truth even if we don’t listen to what Steve Mnuchin says. We know because Republicans have said this out loud, like idiots, that they are trying to push this tax reform package through Congress, through the Senate this week, because it’s what their wealthy donors want. And they’ve admitted that their donors have told them that if they don’t pass it, they’re not going to get any more campaign checks. This is what this bill is all about. That’s why there’s screwing over the working class. That’s why there are massive tax cuts for things like using private jets while we take away tax cuts and write offs for teachers who have purchase their own equipment. They’ve also turned this tax cut package into a half hearted attempt to repeal parts of the affordable care act. Specifically the individual mandate and the subsidies that go to people who cannot afford to buy private insurance and on top of all that, they’re cutting Medicaid, they’re cutting Medicare, they’re cutting social security disability benefits, all so that they can give the wealthy elite a tax break. Paul Ryan doesn’t want you to know that and he wants Steve Mnuchin to go out there and lie to you about it. 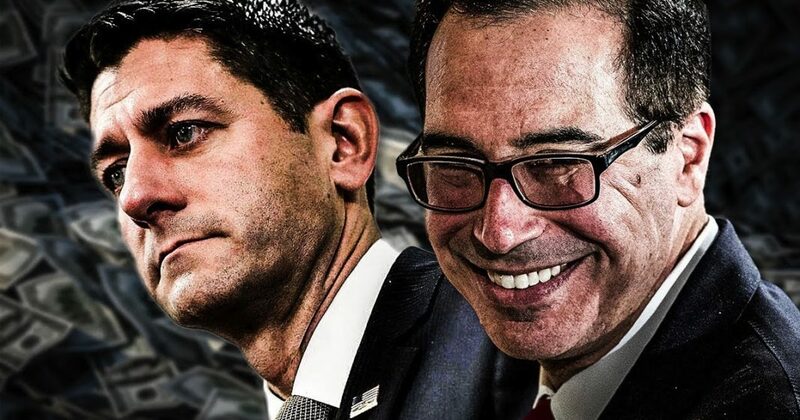 Reports are showing that Paul Ryan within his members of Congress, is fuming about the fact that Mnuchin isn’t going out there and lying about it. And he’s also pissed off about the fact that Steve Mnuchin and his wife Louse Linton posed with that sheet of money looking like James Bond villains. That’s not really a good look when you have couple of millionaires sitting there holding sheets of money when your trying to pass a tax cut package under the guise of cutting taxes for the working class but in reality it’s a giveaway to the same kind of people who are holding up that sheet of money. Paul Ryan is likely to get his way with this tax cut bill and that is unfortunate. However, it’s not something that is going to be permanent, the next President, or Congress even, could come through, repeal this thing, put taxes back in a system that’s more fair, that helps the working class, that allows people who make a little bit more to pay a little bit more to repay the system that made them wealthy to begin with. But, Paul Ryan can’t sell this thing to the public without lying about it. In order for that to be successful, he needs everybody, including Steve Mnuchin, to get on the same page and tell the same lies to everyone so that they can get this passed for their wealthy donors.